It’s not too early to start campaigning for the Minnesota House. Case in point: One suburban seat already has three candidates jostling to go to the Legislature after next fall’s election. House District 53B covers part of the city of Woodbury in the southeastern suburbs, and its current representative, Republican Andrea Kieffer, recently decided she would not seek re-election next year. It’s not too early to start campaigning for the Minnesota House. Case in point: One suburban seat already has three candidates jostling to go to the Legislature after next fall’s election. House District 53B covers part of the city of Woodbury in the southeastern suburbs, and its current representative, Republican Andrea Kieffer, recently decided she would not seek re-election next year. 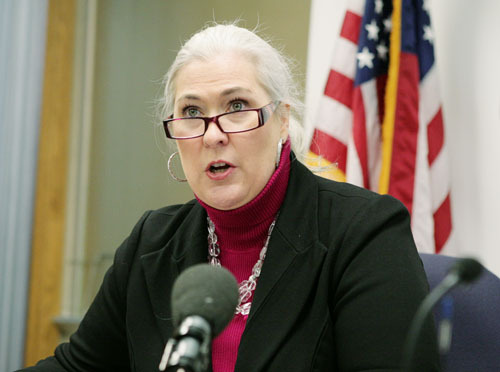 Two Republicans have shown interest since her announcement, including Kelly Fenton, the current deputy chair of the Republican Party of Minnesota, who filed to run for the seat last week. Also considering a bid is GOPer Davin Fischer, a communications specialist who has done work with the National Guard and a handful of GOP campaigns, including that of former U.S. Sen. Norm Coleman. On the DFL side, Kay Hendrikson, who works with the state human services department, has been out campaigning for months. Fenton is no stranger to campaigning in the district, which has been considered swing territory in the past. She managed former GOP Sen. Ted Lillie’s first successful campaign in the area in 2010. That district is just one of more than a dozen in which candidates have already registered and begun campaigning for next fall. With the Senate not up for re-election until 2016, all eyes are on whether Democrats can fend off GOP challengers and maintain control of the Minnesota House in the wake of votes to increase taxes, legalize gay marriage and make way for an election to unionize daycare workers, among others. In some districts, DFL newcomers are looking to knock of incumbent Republicans, and in others Republicans must fend off a challenge within their own party. Political neophyte Dave Sobieski is encouraged by the fact that his opponent, Republican first-term Rep. Steve Green, won his House seat by only 383 votes last fall. The 47-year-old small business owner and air force veteran has been campaigning for almost a full year to take Green on next fall, quietly building a campaign operation and meeting voters around the district. He’s walked in half a dozen parades already and is a graduate of Camp Wellstone, a breeding ground for Democratic candidates in Minnesota. House District 2B is a sprawling rural area in the northwest corner of the state, touching counties like Becker, Clearwater, Hubbard, Mahnomen, Otter Tail and Wadena. The White Earth Indian Reservation occupies more than 1,000 square miles of the area, which is dotted with lakes and farmland. The race for the open seat was competitive last fall, with Green narrowly beating former DFL Rep. Brita Sailer. Voting trends from last year suggest the district leans Republican, with voters approving a constitutional ban on gay marriage and picking Republican presidential candidate Mitt Romney over Barack Obama with 56 percent of the vote. Democrat Dan Wolgamott has already started campaigning to take on GOP Rep. Tama Theis, who won a special election to replace retiring Rep. Steve Gottwalt earlier this year. Wolgamott, a real estate agent and former St. John’s University football player, ran Democrat Joanne Dorsher’s special election bid for the seat. He has also built up a resume in local DFL politics, managing former Rep. Larry Hosch’s campaign in 2010 and doing campaign work for current DFL Rep. Zachary Dorholt last fall. Democrats were trying to capitalize on low voter turnout in primaries to win the seat earlier this year, but Theis, an anti-abortion activist who owns a remodeling business in the area, beat Dorsher and an Independence Party candidate, accruing more than 54 percent of the vote in the process. The area generally swings GOP. Not every legislative race next year will be as simple as Republican versus Democrat. In suburban GOP stronghold House District 30B, incumbent Rep. David FitzSimmons will have his conservative credentials challenged by GOP activist Eric Lucero, who is upset with the first-term lawmaker for his vote in favor of legalizing gay marriage last spring. For what it’s worth, FitzSimmons says he’s heard little about his vote in favor of legalizing gay marriage last session, and he has a lengthy resume in political activism working in his favor. Democrat Tom DeGree, who unsuccessfully challenged GOP Rep. Kathy Lohmer last fall, has already begun raising money to try again, touting the return of the Political Contribution Refund program on his campaign website. His race against Lohmer was the most expensive House contest last fall at roughly $460,000, with most of that sum coming from outside spending groups. Once again, DeGree, the owner of the Wilde Roast café in Minneapolis and a teacher in the St. Paul School District, will focus his campaign on education. “I’ve been a teacher for 20 years and I understand, as an educator, how legislators can go in and make sure school districts are held accountable,” he said. The race for a suburban Roseville-area House district will be a battle of the communicators. DFL freshman Rep. Jason Isaacson, a communications teacher at Century College and a doctoral candidate at the University of Minnesota, currently holds that seat. Before being sworn into office, Isaacson, of Shoreview, was picked by his fellow freshman DFL lawmakers to serve as an assistant majority leader. He already has a challenger in Republican Michelle Manke, a GOP communications operative who lives in Roseville. Manke runs a visual communications firm, Manke Studio, and has done work for a number of candidates, including 4th Congressional District candidate Tony Hernandez, who ran and lost against incumbent DFL U.S. Rep. Betty McCollum last fall. She also worked on communications for GOP candidate April King, who lost in her bid for state Senate District 42 to then DFL Rep. Bev Scalze. Manke was also elected vice-chair of marketing and outreach for the 4th District. House District 42B, which includes the East Metro cities of Vadnais Heights, Little Canada, Gem Lake, southern Shoreview and northern Roseville, leans Democratic. Manke is branding herself a fiscal conservative, pointing to her experience as a small-business owner. She makes little mention of social issues in her bid for the suburban district, which rejected a gay marriage constitutional ban last fall. But she will have a tough opponent in Isaacson, who won his first term in the House with more than 57 percent of the vote against Republican Ken Rubenzer. He’s been involved in DFL politics for more than a decade, working at one point as an organizer for now-DFL Party Chair Ken Martin. This story was updated to correctly identify a legislative district as 2B, in the northwest part of the state, instead of as 2A, in the southwest.